Saint Charles of Mount Argus was born John Andrew Houben on December 11, 1821 in the village of Munstergeleen, Holland. In 1841, he was enrolled for military service and while in the army, he heard of the Passionists and decided to join them. 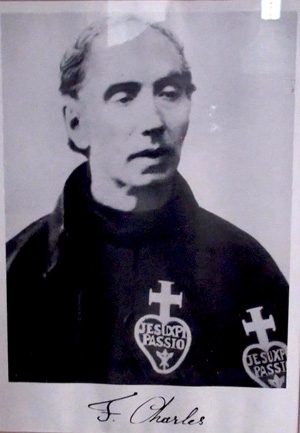 With the military service completed in 1845, Andrew joined the Passionists at Ere, in Belgium. He was ordained on December 21 1850 in Tournai and in 1852 he was sent to England where he first encountered the Irish who were emigrating in the wake of the Famine. He was transferred to Ireland and on July 9, 1857, he arrived at the newly-founded monastery of Mount Argus in Dublin. Fr. Charles (the name that he took on his profession) was not a good preacher but excelled in the confessional and in comforting the sick. His gift of healing the sick is most clearly remembered. As many as 300 people a day came to be blessed by him. Fr. Charles was transferred to England in 1866 and remained there for eight years before returning to Ireland where he would stay for the rest of his life. He died in 1893. Ireland now has a Saint for the poor, for the sick, for immigrants and for emigrants, a Saint for everyone. The Feast of Saint Charles of Mount Argus is celebrated on January 5. Heavenly Father, you filled Saint Charles with your Holy Spirit. In love with Christ Crucified he spent his life in prayer at the foot of the Cross. From the Cross he went forth to bring Good News to the poor, healing to the sick and dying, forgiveness to the sinner. Look now on your people who cry to you. Through the intercession of Saint Charles give us the graces we need. Heal our aches and pains, our hurts and wounds, our anxieties and bad memories. Free us from depressions, habits of sin, and all evil. Strengthen our faith, deepen our hope, and increase our love. We make our prayer through Christ our Lord. Our Father, Hail Mary, and Glory be to the Father.